The courageous and beautiful Mrs. Kim Simplis Barrow. 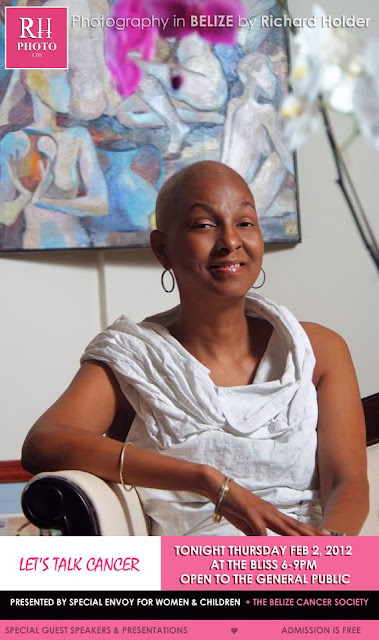 Mrs. Kim Simplis Barrow, the wife of the Prime Minister of Belize has been diagnosed with breast cancer in November 0f 2011, and is currently undergoing treatment in Miami, Florida USA. The general public is invited to attend the "Let's Talk About Cancer" presentation at the Bliss Center for Performing Arts in Belize City tonight. Special guest speakers, Dr. Robert P. Derhagopian, M.D. Admission is free!! We thank you Mrs. Kim Simplis Barrow for giving less of your time to regret and more to smiling when we know you would like to growl. With your strength and perseverance we will change the way we look at cancer! AWESOME!! I commend her for bringing CANCER to the front. The more education our people get the better off we will understand this dredful disease. And yes Linda, she's beautiful with or without hair. I hope tonite will be a hugh success. She is still beautiful, my prayers are with You first lady; I know you will get though this...... Blessings!! Definitely still beautiful!! Who needs hair anyway? Her husband has been pulling off that look for years and she's got him beat! I am so very proud of you Mrs. Barrow for coming out and not covering up your illness, the world needs more people like you. Indeed! What a courageous woman, and very classy. I totally have maximum respect for this woman!!! She makes me feel proud to say she is the 1st Lady of Belize!!!! I also admire her courage. Blessings to her. I have high respect for you Mrs. Barrow you are a role model to many of us, may God's continual blessings bestow upon you, stay bless and know that you are in our prayers. She looks amazing!Her hair will grow back,we will focus on her healing and treatment for now.....most important, we love you and are praying for you. A very brave and strong woman. Yes, a wonderful role model for our young women, God bless indeed. And I do think she looks cute too. Faith is daring the soul to go beyond what the eyes can see. My utmost respect for Mrs. Simplis Barrow. A most beautiful and courageous woman, the perfect role model! You are in our prayers. Kim you are a beautiful woman in and out. Sending lots of love your way. She is amazing and she looks gorgeous! God bless you! SHE IS A WOMAN OF SUBSTANCE AND WORTH ADMIRING. I AM SO PROUD OF THE WAY SHE IS DEALING WITH HER SITUATION. SHE IS ONE OF THOSE WHO SEES THE GLASS AS HALF FULL AND NOT HALF EMPTY. KEEPING HER IN PRAYER AND THANKS FOR SHARING LINDA. Wow, what courage!! Positive proof that beauty is more than hair. We are praying for you Kim; you will be healed by your faith in God. She is such an encouragement to women in Belize and she shows great bravery in making her condition public. My prayers are with you and your family. Beauty realy isn't from the outside it's from the inside, but this beautiful lady has been bless with both.The good God only uses the best in sending out messages to those who need it.... may the good God keep her safe and strong. YES, WE ALL LOVE U KIM, U R GORGEOUS, WOW, GOD IS GOOD. BEAUTIFUL SMILE, BEAUTIFUL 1ST LADY. She looks as healthy as an Ox. If you didn't know she had Cancer, you'd swear she just shaved her head. Wish I knew about this before, I would have gone. I have a son who had cancer at age 14, he will be 33 in Aug. There is hope! !